If you read my last post, you will know I have been having the time of my kids' life adventuring around San Francisco and beyond. We are "celebrating" Spring Break. So, really what this means, since we went nowhere, we have to do a lot more than if we had actually gone somewhere. If you ever attempted a "staycation" you will understand. 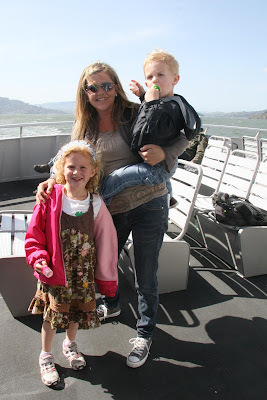 On Tuesday, we ended up on a ferry from Sausalito to San Francisco and my phone was dead. I had no camera, but I REALLY wanted a picture of us riding the waves. So, what does this happymomy do? She found some tourists to help us capture that picture. I asked nicely, handed them my business card and begged them to take a picture and send it to me when they got home. Lo' and behold what was in my inbox today? Thank you sweet people from Colorado. I am forever grateful to have this picture, but more imporatantly being shown that kindness is still a personality trait and not everyone is out for themselves. Well, except for the mom who has no camera and begs others to take pictures for her. Except for that, I do believe in kindness and humanity. What a fabulous picture and what wonderful strangers! I think it just shows that in SF, tourists and locals alike are a pretty friendly bunch! Makes me think that from now on, I am going to offer to take pictures of tourists that I pass. What great luck! Love it. What a great picture too.